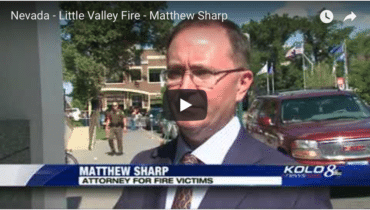 Reno, Nevada lawyer Matthew Sharp is representing the victims of the Little Valley Fire who lost their homes after a controlled burn got away from the Nevada Division of Forestry. In the early morning hours of October 14 winds as high as 70 mph blew through the foothills of the Sierra Mountains fanning the embers of a controlled burn that had run from October 4-7. When the wild fire was finally extinguished five days later almost 2,300 acres had been destroyed along with 23 homes and 17 outbuildings. The value of the homes ranged from $500,000 to $3,800,000 and included historic structures and ranches. The total value of the homes lost is estimated to be in excess of $26,000,000. The State of Nevada may be found liable if the months-long investigation shows that the fire was a result of the prescribed burn crossing the control line and sparking the wild fire. In the days leading up to the prescribed burn, the community was aware of an approaching storm that promised high winds. Many in the community feel that the burn should have been called off. The failure to cancel the burn, delays in responding to the wild fire and inadequate staffing are being talked about as failures by the state that contributed to the massive level of destruction. In a recent hearing, the people who lost their homes in the fire had a judge consolidate their lawsuits into one case against the state of Nevada. Reno’s NBC News affiliate, News 4 reported on the story. View the news clip above. The State of Nevada believes the case should be dismissed since the state’s intent was to protect homes with the prescribed burn. Reno’s ABC News affiliate, KOLO 8 reported on the case for dismissal. View the news clip above.